Long Island Medium Theresa Caputo looked so lonely in her hospital attire after her recent surgery and fans were quick to note this. Sure, she’s going through a divorce but after 28-years of marriage, the couple is said to still be very close friends. So why wasn’t Larry Caputo with Theresa while she went through her recent surgery? This is what the fans want to know. Larry wasn’t with his Long Island Medium estranged wife in New York while she suffered through surgery and days of recuperation at home. But TMZ cameras caught him sharing a shopping cart with a mystery woman in Los Angeles over the weekend. Long Island Medium Estranged Husband has a Thing for Blondes? 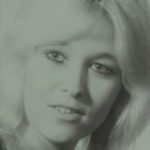 The media site also suggested that Larry may have a thing for platinum blondes as the unidentified woman with him was sporting bleached-blonde hair. They are seen in the Twitter post below. Fans were very disillusioned by the lack of caring shown by Larry to Theresa. Viewers of the show know how close this couple was on both the romantic and friendship levels. Some fans found the pictures that Theresa posted of herself on Instagram rather sad. She was all alone during her ordeal. That Instagram post can be seen below. Big Ocean Wave Put Theresa Caputo In Surgery? So what happened to put the Long Island Medium in the hospital to undergo surgery? Theresa went to Hawaii on a vacation to celebrate her birthday. While she stood in the ocean enjoying the Pacific Ocean waves something happened. “She tore her ACL after getting hit by a wave in the ocean, reports Life and Style Magazine. The procedure on her knee will take a while to heal. Theresa reports she’s looking at eight-weeks of rehab to get her knee back up to par after the surgery. The magazine also reported that Theresa was flooded with speedy recovery wishes. But at the same time, the fans felt Larry should have been there with her. Larry has moved out to the West Coast leaving Theresa in her Long Island, New York home. Last month when reporters caught up to him, he confirmed he has moved on and found someone special in his life. He never mentioned a name, but fans assume that “someone special” was captured in those pictures shopping with him this weekend. Larry didn’t appear to be enjoying too much romance at the time, he was pushing a carriage full of toilet paper and paper towels. That’s probably a good thing. If he was caught in the throes of passion on camera, fans would probably be furious. As of now, they are just a bit angry at Larry for not being by Theresa’s side during her medical ordeal. Theresa did get a visit from a loved one, her son stopped by to “visit his momma.” This is what the Long Island Medium posted under a picture of the two of them together on Instagram. That picture is seen above.